Kids love to cook, and confidence in the kitchen is one of the greatest gifts you can give your kids. I'm by no means an expert chef, but this simple oven bake is perfect to make with kids - quick, easy, cheap and results in clean plates all round. The ingredients depend on what left-overs you have to use up, but it's based around a mashed potato topping, with some kind of mix of vegetables underneath, plus in this case a tin of vegetable soup. 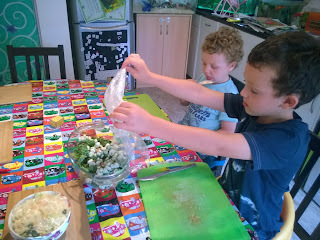 We had left over cooked veggie sausages so the first stage (after washing their hands) was to chop these into chunks and add them to a casserole dish. If we didn't have these, I would have added something like butterbeans. 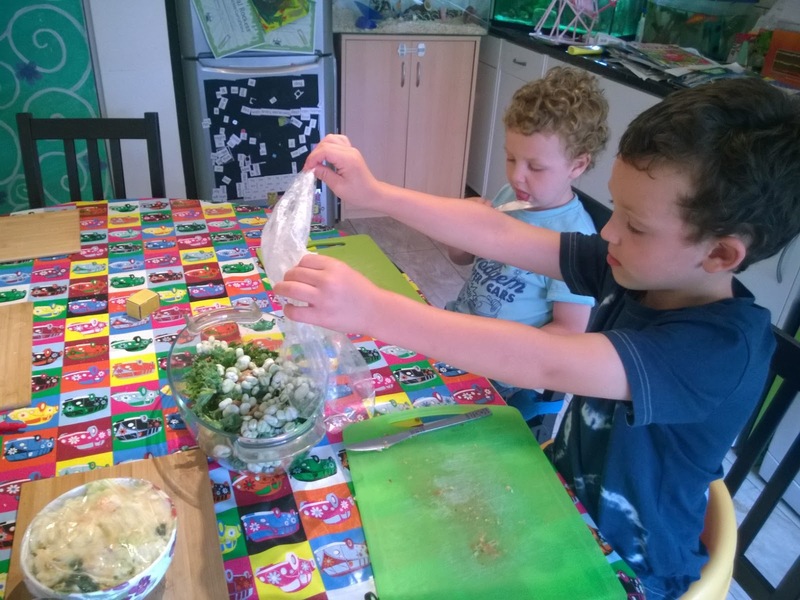 The trickiest thing about cooking with kids is stopping them eating all the ingredients - I don't always succeed but I find giving them a portion of each ingredient that they are told they can eat helps to prevent the whole lot being scoffed in one go. We also had a quarter of a bag of kale, so this went in. Our broad bean harvests from the allotment have been good and we have plenty of bags of beans from this in the freezer, so that was the next thing added. Any quick cooking veg such as peas or sweetcorn would work too. The sausages and veg were given a good stir up and a tin of vegetable soup added (again, substitute with anything to hand including left over gravy, a tin of chopped tomatoes or cheese sauce for example). The mash (allotment potatoes and cabbage plus carrots) was a bit cold and stiff, so I added hot water and gave it a good stir around in order to make it easier for the boys to spread. 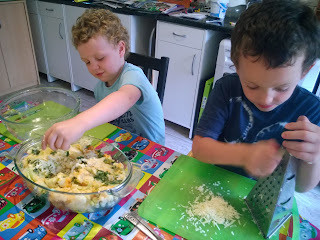 Ollie grated up cheddar cheese for Toby to sprinkle over the mash. If we don't have two sets of equipment for something, allocating separate responsibilities to the boys reduces arguments. I put the casserole in the oven on a medium heat (about 180 degrees centigrade) for around an hour. 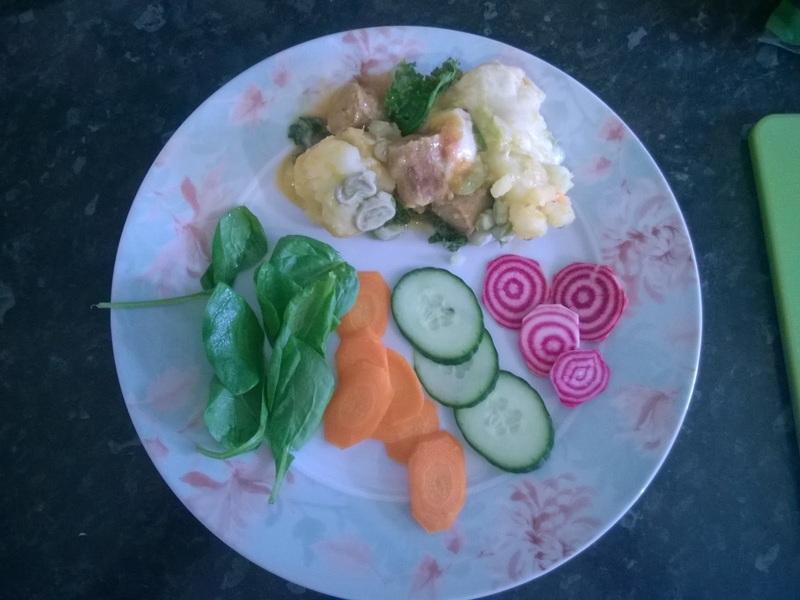 The cooked casserole was then served with raw veg (we try to incorporate some fresh raw food into every meal). On that day I used baby spinach leaves, plus finely sliced carrot, cucumber and Chioggia pink beetroot from the allotment. I served it with a simple olive oil and balsamic vinaigrette (made by Ollie) - just a couple of tablespoons each of vinegar and oil. 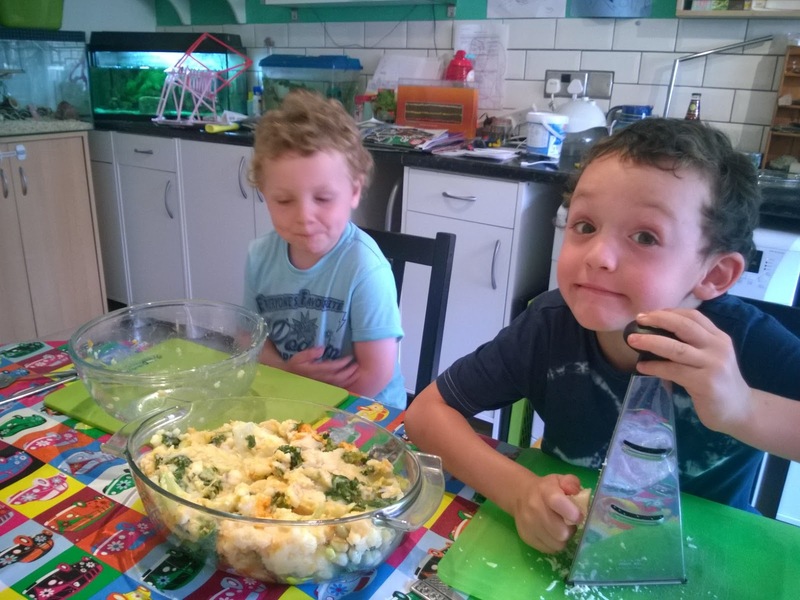 The idea of this meal is not to produce high cuisine, but just something that the kids can pretty much do entirely by themselves. This means it is great for their self esteem, as well as all the chopping and mixing being good for fine motor skill development. 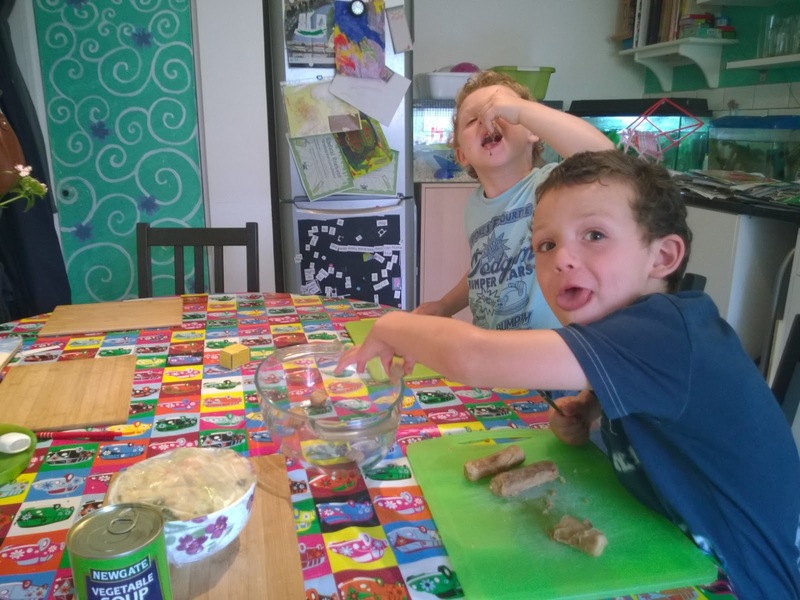 You can also increase self esteem by giving them as much choice as possible over selection of ingredients and making an event of enjoying 'their' meal together. Note: Cooking with left-overs is one good way to reduce food waste in the home, but as this meal is made from left-overs should you have any left I wouldn't reheat it again.